It’s now entirely possible to treat severe burns with skin grafts in just half an hour. ReCell is a product by Avita Medical that uses regenerative medicine technology to literally grow skin. 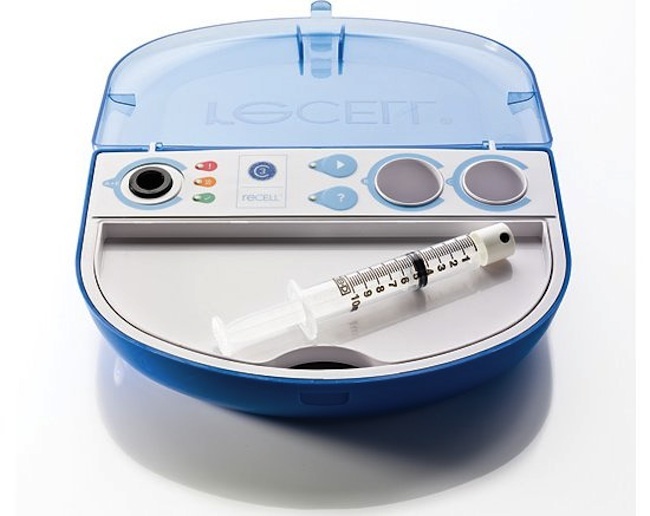 It is a small kit that comes with a syringe which has a nozzle at the end of it instead of a needle. That’s for spraying the grown replacement skin on the affected area. The kit contains a special solution that can trigger the growth of keratinocytes and melanocytes (which are types of skin cells) in just around 30 minutes. In that short period of time, the sample used would have reproduced at such a rate that it becomes 80 times larger than the original amount. The usual process of making skin grafts in a lab actually takes weeks. The recommended procedure is to use a sample from the patient’s own skin. In this way the replacement skin won’t be rejected by the patient’s body. There is also less risk of incurring disease or infection unlike when the sample comes from a donor. The stated benefits are that burns heal faster and that there is less scarring afterwards. ReCell is already available in Canada, Australia, and Europe. The system is still undergoing clinical tests in the US.